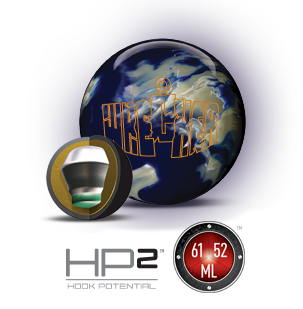 The WRECKER by Roto Grip will serve the majority of bowlers as a really solid benchmark ball. It's the strongest member of the HP-2 Line of the Roto Grip arsenal. Built around the same Neutron™ core as the SHATTER, the WRECKER's 52ML™ hybrid coverstock gives it by design an earlier and stronger move down lane than the pearlized SHATTER. My WRECKER has one of my favorite standard drillings. The Pin is about an inch above the ring (4.25 from PAP) with about a 60° drilling angle. My first trip out of the box with the WRECKER was on a medium/heavy, pretty well blended, 42-foot doubles tournament house shot. My 8-game set of 2091, including two 300's, left me with no doubt about the WRECKER's hitting/carry power. The good continuation it provides through the pins turned a lot of heads. The most noticeable thing for me right off the bat was the strong, tight, and heavy roll the WRECKER gets into when the core kicks in and the ball makes its move down lane. In my opinion, it is the most angular ball in the Roto Grip arsenal at present. 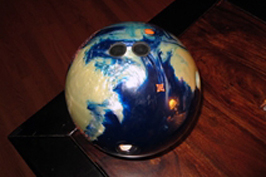 After several months in my bag now the WRECKER has most often been a great go-to ball when I've needed to be able to open up the lane more than just a little. At this year's USBC Open Championships, needing to migrate to 25-board by the end of Minor Events, the WRECKER was perfect in giving me the hitting power and the angle I needed down lane to shoot 704 in singles. Without having drilled the WRECKER with a number of different longer or tamer layouts, my intuition is that if it had just a little more built-in length it'd be even more useful in my arsenal than it already is. Especially on flatter patterns that are medium/light in volume or medium/short in length - even trying it at different surfaces - the WRECKER sometimes reads too soon for my taste and, in those situations, can make controlling the break point front to back a little difficult. Trying to spin it a little to get it down the lane cleaner at those times usually results in what feels to me like small-pocket, over/under pin carry. Nonetheless, I believe the WRECKER has a justifiable place in every bowler's arsenal. Particularly if you're a league bowler who faces a pretty standard house shot each week, you'll find the WRECKER a great asset in your bag and fantastic bang for the buck!